Taj Mahal is the most important monument in Agra which is the symbol of eternal love. It features among the Seven Wonders of the World. 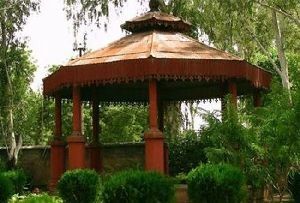 Taj Mahal incorporates both Persian and Hindu elements; therefore Taj Mahal flaunts a Persian style garden. 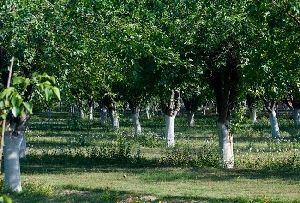 Garden in Persian culture is a very important motif as Quran equates a gorgeous garden with ecstasy. Stretched from the main gateway to the doorway of this mausoleum, the lush green Taj Mahal garden in Agra is based on symmetry and geometrical measurements. 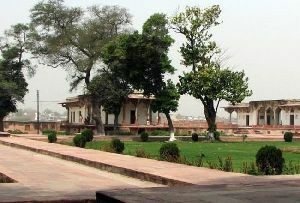 Taj Mahal gardens, Agra mostly feature religious motifs. The Water Garden, for example, is divided into four equal squares by two marble canals. The garden is bounded by cypress trees and fountains; the garden conjures up the Islamic concept of heaven where rivers of water, milk, wine and honey flow. At the center of the garden and the mausoleum a lotus shaped tank is located. The water in the tank acts as a reflective facade and the image of Taj can be seen on the water from any spot in the garden. The exclusive location of the tank helps the mirror like viewing of this extravagant monument of love. The Taj Mahal Garden in Agra features a Persian style garden which symbolizes heaven, since Quran describes paradise as a beautiful garden. On the other hand the water garden of the Agra Taj Mahal garden feature two marble canals with fountains and lined with cypress trees (symbolizing death). This divides the garden into four identical squares (Islam recognizes four to be a holy number), the stone paved pathways again subdivides each flower bed into 4, making total of 16 flower beds. The tank has been arranged to provide a crystal clear view of Taj in its water. The view looks wonderful with the reflection of Taj amidst the green cypress trees. 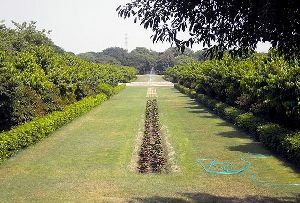 Taj Mahal Garden in Agra displays a unique irrigation system. Water in the canals was drawn from the river using purs, a system of drawing water physically from river using bucket and ropes. For irrigation the water from the overflowing canals was used. The north-south canals had its water bay through fountains and east-west canal had its water bay through a intermingling with north-south canal. It has been made very uniquely which still astonishes the tourists who come here to view the eternal monument of love.